It’s been awhile since I did a review on an event that I attended at the Mediacorp TV Theatre. Simply because when I accepted the invites from Mediacorp Suria to attend these shows or events, more often than not, I did not see the need to review as they are either a light-hearted affair or for charity. I was there to just snap photos of the event and during the reception afterwards without seeing the need to comment much. Sometimes I don’t need to voice my thoughts as others have done it for me on social media. Anyway there are so many keyboard warriors out there too quick to jump on the bandwagon of criticising without giving substantial suggestions. I guess it’s a favourite pastime now to use one’s handphone keypads to comment every single thing they see on the google box, be it good or bad. I’m guilty of it sometimes when I watch football and passions are running high. I note from several people I’ve met of late that this blog has somewhat stagnated and that the writer (or should I say, typist???) behind the words on this domain has lost his zest and panache to hit where it hurts, or to put it kindly, give a wake up call when it mattered. Over the years as I mellow down and become less confrontational and got to know more people, I find that it is a challenge to be as hard-hitting as before. I had to tweak and fine-tune my style so as not to be too cynical or cause frictions with others in the long run. Maybe fatherhood has made me more forgiving, understanding and giving others the benefit of doubt but I like to think I type better when I’m having that red mist and I don’t quite experience that as often as before. Wish I could post more entries but like I said from time to time, I am not paid to blog and this is something I do as a community service as and when I am free from my work, family and personal commitments. Anyway, I was honoured to be invited again to attend the recent Viva Elektra event at Mediacorp TV Theatre. The two-hour variety special was the fourth instalment by Suria and was previously known as Suria Elektra (2010), Rock Elektra (2011) and Bandstand Elektra (2012). The show belatedly celebrated the formation of MediaCorp’s Malay Broadcast Division, the merger between television channel Suria and radio stations Warna 94.2FM and RIA 89.7FM, hence there was an eclectic mix of performers from radio presenters to television personalities and established recording artistes that night. Viva Elektra in a way, symbolised the division’s hopes to establish a commitment to continually bring high quality programmes to their audience, be it on radio and television. Expect to see more of such shows in the near future involving the radio and television personalities. We are already anticipating cross-platform programmes like TeRaSeh 2.0, R&D and the sixth season of infotainment show JUS! this month. Viva Elektra was just the start!!! Looking at how the radio and television personalities collaborated on stage, I had a feel-good feeling that we can expect more entertaining shows on television and radio as well. Yes, I will not deny that I’ve heard rumours going round that certain gigs and jobs are affected due to the merger, but I would like to call upon all the artistes who might feel a little slighted that their places and roles in television programmes might be taken up by their radio counterparts, to treat this as a healthy competition. Granted we might not be like our next door neighbour where there are so many channels one can tune to and for radio and television personalities to still do well when they cross platforms, but there are possible avenues that can be explored. Radio could possibly have seasonal guest hosts like what Fauzie Laily did co-hosting Skoolz with Nity Baizura a few years ago. Or if they were to have a shake-up of personnel, who knows, they might just rope in some of these television personalities into their stables??? Let’s not see it as a form of hindrance to one’s rice bowl, but to work as a unit to lift the standards of our local Malay entertainment scene. Maybe a little criticism I would have of Viva Elektra was that feeling of imbalance in some of their segments. While the skit involving the Tak2ut cast (Ashmi Roslan, Wan Haddad and Fadhlur Rahman) and DJ KC seemed a bit short, the Bangsawan and Pentas Radio segments felt a wee bit too long for my liking. 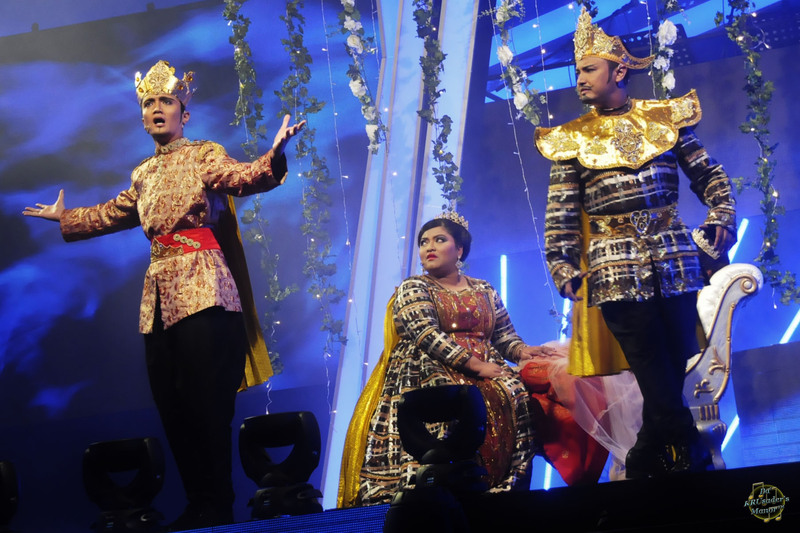 I just feel that the song performed by Eiss, “Arjuna (Mencari Cinta)“, was redundant and only served to prolong the segment, even though the audience and myself were tickled by the humour presented by all the performers involved. It is nice to see new faces on television like Wan Haddad and Nurfarhana M Noor given their big break on a big scale event as this. Also Junaidi Sali who often plays a supporting cast to be given the limelight he deserves after all these years. Nurfarhana it has to be said, is a name and face to watch this year. Her stock is rising and it is not easy to score a lead role in one’s debut drama series (Rima Hatiku) and subsequent ones like Follow Fasha, unless one has the potential and package to succeed. She is currently seen in the new season of Di Luar Garisan and will be one of the participants for TeRaSeh 2.0. I won’t be surprised if she scores a hosting gig in the near future cos she has that bubbly personality to do it. You heard it first on this domain. Another one to impress me was RIA 89.7FM‘s Dzar Ismail. I’m a big fan of his daily Singa Maksima programme and from one karaoke session we had some months ago, I could see his hidden talent and passion in rapping, which was displayed that night when he performed “Cerita Kedai Kopi” with Tukangkata and Sezairi Sezali. I know some people do not quite like his sometimes excessive energy levels, but I think he is a breath of fresh air on radio. And yes I still claim credit unashamedly for saying he belongs in radio when I assessed his performances when he entered Anugerah Skrin back in 2010. Another criticism I would add on will be the choice of performing artistes and some of the songs they performed. Before the show, I saw on social media how people lamented that it’s basically the same faces over and over again. To some extent, I would agree with them as I too felt the same way when I saw the list of performing artistes slated to perform. No I am not attacking or blaming the singers who performed cos they are all excellent in their own respect. My complaint would be a lack of more variety than what we’re used to. Take for instance we have so many bands producing good quality music in Singapore. The likes of Diorama, Tujuh, Klutz are some of the bands that are under-rated here. And if you speak of individual acts, there’s Reyza Hamizan, Sufie Rashid, Chomel, Aidil Akmal, Nurdiana Saad, upcoming acts who deserved to be given their dues and be introduced to the masses. I appreciate that we would want to entice people to watch as their favourites would be performing but it does not send a message that the artistes feel appreciated, even though radio plays their music on a daily basis. There is no point having your songs known on radio when people still dunno who you are. Just ask Audionauts when they won at APM2013. There were still people asking on social media and on newspaper reports wondering who they were. “Rentak Laguku“, the song performed by Aliff Aziz, Eiss and Sezairi Sezali, was another one that I felt was a bit redundant as it was only as recent as last October that we witnessed Amy Search and Bunkface performed the song at APM2013. And even though I love Taufik Batisah‘s “Sesuatu Janji” amongst all his songs to date, I think that was the fourth or fifth time he performed the song at a Suria event, in addition to APM2008. Overall, Viva Elektra was an enjoyable show, even if it did overrun by about eleven minutes. The choice of having Khairudin Samsudin and Warna 94.2FM‘s Dyn Norahim was a good one, with both trading barbs at one another and the latter being the brunt of many of the former’s jokes. At certain points, Dyn looked jittery but it should be forgiven as this was afterall his first live television hosting gig. Speaking to him afterwards, he said that it was nerve-wrecking and a very different experience compared to his daily live show on radio. Like many others before him, I am sure he will grow into the role and be better. Am certainly looking forward to seeing him host the new season of JUS! alongside the gorgeous Ainon Talib and Nurul Akhmar come the end of April. For now I can’t wait for TeRaSeh 2.0. It’s gonna be an absolute riot!! !